This image from around 1930 shows Canadian Pacific locomotive 2614 headed north-east along the tracks that cut a 45 degree angle through the East End of the city. We’re familiar with pictures of tracks running down the street carrying the interurban and streetcars of the BC Electric Railway, but don’t often see the full-sized locomotives that could shut the street down for several minutes. The engine was probably coming from the Canadian Pacific Drake Street Yards – here’s another view of the Class G2E 4-6-2 locomotive built by the American Locomotive Company in the yards (on the right). 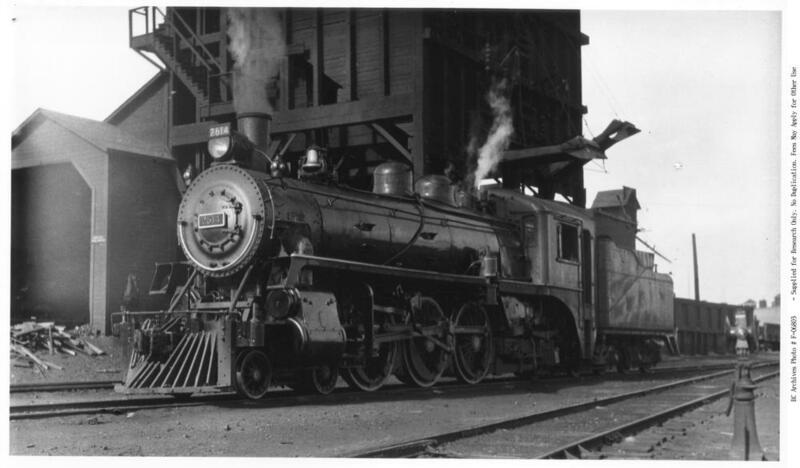 There’s another picture in the City Archives of the engine in the station below Cordova Street in the 1930s, attached to a passenger train. The locomotive was sold for scrap in 1959. There’s a challenge in lining up the contemporary image: the right-of-way that the train ran on has been built over. We’ve seen the building in an earlier post. It’s part of the Four Sisters Housing Co-op; this part was a newbuild component and there’s an attached heritage warehouse that in part dates from 1898. In 1988 the heritage building was converted to residential use, with the new structure replacing the right-of way as a part of the Co-operative, designed by Davidson and Yuen Partners for the Downtown Eastside Residents Association. Like the last image we posted, we’re looking at Mau Dan Gardens. These are the four storey apartments that are part of the Mau Dan Co-op, designed by Joe Y Wai and completed in 1981. It’s not so easy to line up the contemporary image because Dunlevy Avenue used to go through this site, but today it’s an internal area within the Co-op’s gated enclave. We’re pretty certain our image dates from the 1960s, before the site was cleared in the 1970s. The Co-op pay an annual fee to the City of Vancouver to have exclusive use of the roadway: when the project was first built there was still public access, but in 1995 City Council agreed to lease the land to improve safety, security and privacy for the residents. Before the comprehensive redevelopment of this block there was a mix of residential and commercial property here. This was the 300 block of East Pender; Merv’s Auto House had once had a gas bar, but by the time this picture was taken had became a welding and repair shop with ‘Bee Line frame straightening’. This was a very Chinese part of town: all the names on Dunlevy and this part of E Pender were Chinese in the 1950s, and the Lore Yee Jang Tong had their fraternal house just out of shot to the west, with the Yin Ping Society a little further down the street on the same block. This corner site was first developed with two houses; architect and builder W H Chow was hired to make repairs to one of them in 1914. By 1912 it was known as East Pender, but it had been named both Princess and Dupont before that. In 1926 this was identified in the street directory for the first as the Downes Super Service, run by A Downes, but the rest of the street were described as ‘chinese’, which in 1930 became ‘orientals’. A decade later a few Chinese names were recorded, as well as the Ten Yick Reading Room next to the tong house. Downes Super Service were still in business until 1940, still run by Arthur Downes, who lived on W10th Avenue with his wife Cornelia. The service station briefly became the Harry’s Super Service, then the Victory Service Station, but by 1943 it was closed. In 1946 Lees Transport were operating here, and from 1950 the premises were G Vernon’s tire service. When W E Graham took this picture in 1966, Strathcona was an area of the city that was still threatened with obliteration. The ‘urban renewal’ of the neighbourhood and parts of Chinatown were still on the table – although it was becoming apparent that the local community weren’t going to roll over and allow their homes to be bulldozed, at least not without a fight. Several blocks of houses and businesses had been flattened, and new rental housing (at higher densities) had been built, ostensibly to rehouse the community. The McLean Park housing development between Union, Keefer, Gore and Jackson is immediately behind the photographer; construction was started in 1963, and completed in 1970 (although the design dates from the 1950s). The homes in the picture had already been expropriated by the City of Vancouver some years before. We don’t know who built them, or exactly when, but they were already built when the 1901 Goad’s Insurance map was published. In 1967 it became apparent that even if the City of Vancouver still favoured ‘slum clearance’ of the entire area, other levels of government wouldn’t be funding the remainder of the program. We’re not sure exactly when the houses were demolished; there’s an Archives image that shows a few were still standing on the block in 1973. The dramatic change in levels that resulted from the redevelopment can be seen clearly – the houses were on a much higher level because, as with much of Strathcona, the streets were leveled after the houses had been built. The City’s plans for this site intended it to be sold to a private developer for market housing, and it was sold for a third of the cost to assemble it. The purchaser blew the deal and didn’t develop the land as promised; lawsuits ensued and the city eventually regained the land. The City then proposed that a fire hall should be built on the site, but after local objections that was built on Prior Street and the land was reserved for family housing. Mau Dan Gardens was developed by the Strathcona Area Housing Society, (a spin-off from the Strathcona Property Owners and Tenants Association – SPOTA – the community group who successfully fought the comprehensive redevelopment of the area). It was designed by Joe Y Wai and Spaceworks Architects, and built by the Turnbull and Gale construction company. Some of the units were sold, and remain freehold properties. The majority of the 128 unit project is a housing co-operative. The founding membership of the Co-operative were predominantly of Chinese ethnicity, but included families of Vietnamese, Cambodian, Japanese and Canadian origin. In the past couple of years the complex has been comprehensively updated for the first time since its 1981 completion. New energy efficient windows and roofs were provided, the wooden frame repaired where needed and a new rainscreen stucco finish applied to the outer walls over improved insulation and soundproofing. These two buildings are immediately to the north of the previous post looking at the west side of Richards Street’s 500 block. The building on the left is 569 Richards, and unusually, it started life as a residential building, but today is office space. With a 1912 completion, the Oakland Rooms appear first in the 1913 directory, when S R O’Neal was the proprietor, followed in 1914 by William Jureit. In 1915 there was another proprietor listed, Mrs. H Chappell (and confusingly, another Oakland Rooms on Main Street). Haley & Sutton were the owners of the building; Braunton and Leibert were the architects and Davis & Saunders built the $28,000 investment. In an earlier post we had understood that Haley & Sutton had sold out their business to Gordon Drysdale in 1893; that’s what early biographies state. However, it seems that a company with that lived on, although not in Vancouver for several years. The earliest mention of Haley & Sutton we can find is for Walter Haley aged 23 and William Sutton aged 21, both merchants in the same household in Dufferin, Marquette, Manitoba. Walter H Haley of Haley & Sutton was running a general store in 1884, in Nelson. However, this wasn’t Nelson, British Columbia, but rather Nelson, Manitoba. William Sutton ran a store in Milton, Manitoba that year. Both partners relocated to Vancouver in the 1890s. They first appeared in the 1892 directory, with premises on Cordova Street and in New Westminster, with William Sutton living in rooms at 1031 Robson Street and Walter Sutton at 1033 Robson Street. However they were here a little earlier; Walter Haley was living in Vancouver in time for the 1891 census, aged 32, a dry goods merchant born in Ontario, as was his 19-year-old wife Cora Belle. (Strangely, there’s no mention of their son, born in 1890). William Sutton was also recorded living in the city, aged 30, born in Ontario and described as a dry goods merchant. His wife, Harriet wasn’t shown to be with him, but that might be because their first daughter had been born earlier that year in Ontario. In 1906 Haley and Sutton reappeared in Vancouver as real estate brokers, with offices in Davis Chambers and Walter Milan Haley living initially on Haro, then in 1907 on Barclay, and a year later on W3rd. William J Sutton was first living on Beach Avenue, then Nelson Street, and then in 1908 on Comox. The 1911 census showed Walter Haley aged 51, his wife aged 39, both from Ontario, and their three children; Herbert aged 19, born in 1890, Reginald, 17 and Walter, 15. Herbert was born in BC, but Reginald and Walter were born in Manitoba. Walter Haley had Gamble & Knapp design a $5,500 house on West 1st Avenue in 1911 (redeveloped in the 1980s). William Sutton and his family remained for many years on West 5th Avenue, where they had moved by 1914. He died in 1931, and his wife, Harriet, in 1952. Although both Haley and Sutton were listed in 1914, with W Haley still in real estate, the company doesn’t seem to have survived the 1913 crash. Walter Haley died in 1943, aged 84, in Chilliwack. The main floor tenants of the building they developed changed several times over the years, but the Oakland Rooms continued to operate upstairs until at least the 1950s, but probably changed to office use before 1970. Next door, 555 Richards is a more recent building, completed in 1928. Harvey & Gorrie, auctioneers, appraisers and furniture dealers were the first occupants of the new building. They had been in business on West Pender before moving here. Thanks to Patrick Gunn’s efforts we now know that according to the building permit D J McPhail & J M Livingstone commissioned Scottish-born J S D Taylor to design the $21,000 investment, built by veteran builder Bedford Davidson. We suspect that the clerk recorded the name McPhail incorrectly, and that it’s more likely that he was Daniel J MacPhail. There was obviously a lot of confusion generally about the spelling of his name. In the 1891 census there isn’t a single MacPhail in the country, but 8,300 McPhails. In 1901 it gets mixed between the two spellings. The 1910 street directory listed both John McPhail and John MacPhail as a tinsmith, living in the same house, but as there was only one tinsmith with that name in every other year they were presumably confused as well. We’re not sure whether this D J McPhail is the Dan McPhail who acquired a building on Water Street with Jacob Kane. We know that in 1912 a D J McPhail built an expensive house for himself in Shaughnessy, and there was a Daniel MacPhail who was a real estate broker living at 633 Broughton Street with his sister Christina, a nurse, in the 1911 census. They were both born in Ontario; Daniel was aged 30, his sister was 27. The first time Mr. McPhail appeared in the street directory was in 1909 when D J MacPhail, real estate was living at 1242 Burrard. In 1910 he opened an office in the Dominion Building. D J McPhail apparently hired Twizzell & Twizzell, architects to design a house in Shaughnessy (according to a report in the Province newspaper). He also hired MacKenzie & Ker to design an $11,000 house at the same address – we’re not sure which version he built, although to us it looks more like a Twizzell design than MacKenzie & Ker, and there’s a permit to build a garage that was designed by the Twizzells. We’re not sure where Mr. Macphail got the capital to become a property broker and develop such a grand house. There was a silver miner from Ontario working in Kaslo, but he appears to have been older. It may be that he was a successful broker in the right place at the right time – in 1911 for example he identified a large site to sell to the City of Vancouver for their isolation hospital (built in Grandview). In 1916 Daniel McPhail was still listed at the Shaughnessy address, but in 1917 Fred Begg had moved into the house. In 1919, although Daniel still wasn’t in the city, Christina McPhail, a nurse, was living at 1297 W Broadway and a year later a block away at 1351. In 1921 she was still at the same address, but called MacPhail. In 1925 Don J McPhail was at 1149 W 27th Avenue – in 1926 he was identified as Daniel J McPail, ‘retired’. In 1927 he was still Daniel J and in 1928 he was back to Don, but associated with real estate in both 1927 and 1928. So we’re reasonably sure that Daniel J McPhail (or MacPhail) was back in the real estate business in the 1920s, and it seems probable that it’s the same Daniel who had left the city during the war. We have a clue about why he may have left town. In 1917 he fought – and lost – a court case where the YMCA accused him of offering to give them $5,000 towards their new Georgia Street property, and then not fulfilling that promise. The Daily World, in reporting the court case described him as ‘a prominent resident of Vancouver’. We don’t know whether he paid up. His partner in the development might have been John M Livingstone, manager of the City Dairy Co and then the Vancouver Creamery Co until 1927. We haven’t managed to trace him after that; he may have retired and moved away from the city. Today both buildings are office space; with the investment cost of the properties recouped many years ago this block is a candidate for assembly and redevelopment, Whether the old, but not heritage buildings would survive as anything other than facades (if at all) is doubtful. We noted in an earlier post that the building on the corner with Dunsmuir (on the left of the picture) may not be purely a 1988 structure. This 1974 image shows that the Bible Society building shared similar dimensions, but looking more closely we think the façade at least would require a complete reconstruction to change the windows as much as they were. Next door the BC Stamp works is almost identical over the 40+ years. The building is shown as having been completed in 1926, although underneath is an earlier house. In 1896 it housed Mrs. S McDonald, Alex Wilson, William Taylor, Mr. Bradley, Mr. Simpson and Dr. J A Mills, who had his office next door on the corner of Dunsmuir, and who built a house there in 1896. Mrs McDonald continues to be associated with the address for several years, although the street directory doesn’t always list anyone else, suggesting she was running a rooming house. In 1901 Mrs. Sarah McDonald and Dr. J A Mills are listed here, but at separate addresses in the same building, and by 1903 Dr. Mills has moved to the corner property, and William McDonald a teamster has moved to 579 Richards and Sarah McDonald, widow, is shown at 581 Richards running a boarding house. She was shown running it in the 1901 census, aged 41, from Ontario, and with six male lodgers including a carpenter, a machinist and a CPR ticket clerk, and two female guests; Hilda Thompson, a 35-year-old chamber maid from Norway and Annie Maslin from BC, who was aged 30 and a Dining Room Girl. S Astell had the house rebuilt in 1911 when the permit sought to have the house lifted and altered. This was Ontario-born contractor Sebastian Astell, who lived with his brother, wife, five daughters and one son on West Pender. Once completed, Hunter and Henderson, decorators occupied the basement and there were three separate suites; one was vacant, A Kjos was in another and Mrs. Nina H Perine was at the back. These days it’s run as the Urban Hideaway Guesthouse, an apparently cash-only cross between a b&b and a hostel (with prices closer to b&b than hostel) with seven guest rooms. The BC Stampworks were in the building long before our 1974 image. The earliest we can find them under that name at this address is 1930 – which must make them one of the longest-running continuous business locations in the city. The company goes back to 1909, and as the previous occupants of the premises were Houghton & Smith Ltd, who also manufactured rubber stamps and other marking devices, that continuity is even longer. They had moved in only a couple of years earlier, moving from West Pender, and replacing Love & Co, who were auctioneers. The more ornate four storey building on the right was developed by Captain Henry Pybus, built by the Provincial Construction Co, cost $30,000 in 1911, and was designed by S B Birds. We’ve seen another of Captain Pybus’s investments on West Pender Street. A Master Mariner, born in South Africa, in Vancouver he commanded all three of the CPR ‘Empress’ line ships. He was married to Florence, and had two children, Ann and Mary, both of who married into the Bell-Irving family. He retired in 1911, and lived in Vancouver until his death in 1938. The date of construction suggests that Captain Pybus turned his savings into real estate on his retirement. He also became very active in the Art, Historical, and Scientific Association of Vancouver, where he was President from 1921 to 1927. The 1912 insurance map references the building as the Dunsmuir Rooms, although there’s no entry in the street directory until 1914 when Sarah L Shaw was running the establishment. In 1918 an advertisement in the Daily World offered “up-to-date rooms at $2 a week and up”. Today it’s the Hotel St Clair, although it’s more of a hostel with shared bathrooms, and very reasonable hostel rates for the rooms. (The hostel’s website will tell you “It was the first concrete building in Vancouver”. It wasn’t; the four storey building is wood frame and the front facade is clad in concrete that has been cast to appear like stone). A 1996 proposal to redevelop as a larger rooming house with en suite bathrooms behind the preserved façade was never pursued. We looked at the building on the right hand edge of this image in an earlier post. It was designed by Sydney Eveleigh in the late 1920s in a very English Georgian style that’s comparatively unusual in Vancouver, and once home to the Georgian Club. Next door was a bigger building – actually, if you look closely it was two buildings built at slightly different times and reworked to look like one. This was home to the B C Telephone Co, Ltd telephone exchange. 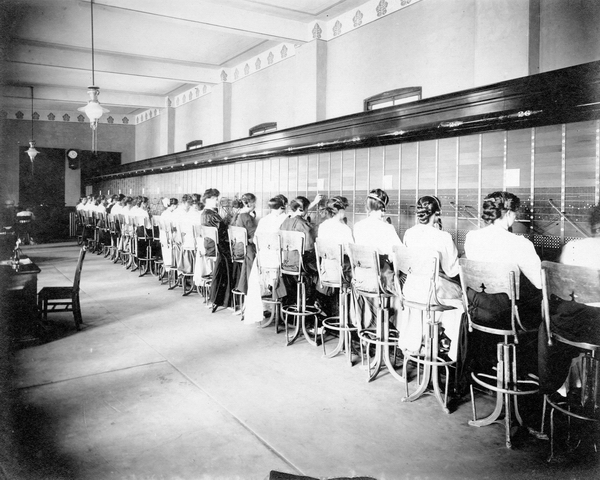 As the city demand for phone lines grew they added another much bigger and more expensive building two blocks away to the north in 1914, but continued to use this building as well. The first part of the building here was designed by Dalton & Eveleigh in 1906; (that’s the same Eveleigh as the 1929 building on the right). 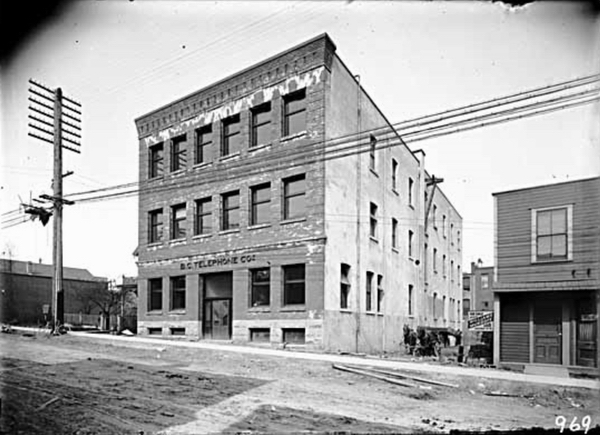 The Contract Record in February reported: “Plans have been completed for the new building to be erected on west side of Seymour street, between Dunsmuir and Pender street, for the British Columbia Telephone Company, and tenders will shortly be called for by the architects, Dalton & Eveleigh. The building will be of iron, steel and concrete.” In March they announced that the contractors would be Baynes and Horie. We know what the building looked like inside – here’s a 1907 image also in the Archives. An addition to the building was built in 1910 designed by Cox and Amos and costing $20,000. That seems likely to have been the northern 3-bay addition, as the Philip Timms 1909 Vancouver Public Library image on the right shows, the northern addition hadn’t been added then. The entrance was later reworked so that the building retained some sort of symmetry, although the northern part wasn’t quite the same because it had to have its own flanking wall, and so slightly narrower windows overall. There’s a 1912 image that shows the original façade of the first building, with the new wing alongside so the more elaborate doorway in the middle was a later change. BC Tel (as they became) retained the building for many years. In 1940 it was still the Seymour Exchange, but by 1946 it was part of the company’s maintenance operations. By 1955 it was used for the long distance exchange, with the employees medical services offices. We’re fairly certain that BC Telephone were still using this building when the 1974 image was shot. The downtown campus of BCIT has occupied this location since 1996. Designed by Aitken Wreglesworth, the departments here are business and media, computing and information, and international student entry programs, with many students attending on a part-time basis. Image source: City of Vancouver Archives CVA 778-410 and Bu P498 and VPL. We first looked at the Masonic Temple built at Georgia and Seymour in an earlier post (only our second on the blog – so 600 posts ago). It was designed by Dalton and Eveleigh in 1909 and was built at a cost of $45,000. Before this there were three different lodges meeting in different leased spaces. Subscribers from the membership of the three lodges; the Mount Hermon, Cascade, and Acacia Lodges, raised the funds to build the new hall, which was opened on March 15, 1910. The picture from 1938 shows a Safeway store and J S MacLaren’s Children’s Shop. Safeway had 35 stores in the city in 1938, having absorbed the Piggly Wiggly chain in 1935. Safeway had operated here from the early 1930s, replacing the Fountain Lunch that was here in 1930. The store closed down in 1946, was empty the next year, and in 1948 became a piano store with the ticket office of the Vancouver Symphony Society; the Freemason’s still occupied the upper floors that year. The building was redeveloped in 1971, although we’re pretty sure that the frame and elements of the structure remain. The staining on the northern, wider bay on the Seymour Street façade suggests that underneath that part of the building has a different construction. The building is part of the Bay Parkade site, and now that the owners are reaching the end of the construction of their building now known as the Trump Tower, and have completed designs for their Little Mountain housing project, we may see a development proposal for this location.